Sweet corn season is here. In many places really good sweet corn can be had, like farms markets, road side stands and even Wegmans! I don’t know about you but when I only am making one or two ears it seems silly to fire up a tall pot of water. I do steam the corn which only takes an inch or so of hot water but still…too much to do. Three summers ago, on a hot day, I realized there was a quick and easy way to make an ear…or two without that big hot pan of water and steam. I just take a large frying pan, put a quarter inch of water in it, sprinkle of salt and let it heat until bubbling. I then lay in my ear or two which I have husked and removed all the silk. Then the pan is topped with a lid or an empty pizza pan if your frying pan is too big for your lids. Cook it the usual time; depends on how fresh the corn is. The fresher your corn ears, the less cooking time you need. The steam in the pan will cook it really fast. Maybe 6 to 8 minutes. And the bonus is that if it runs out of water your ear will get a bit of carmelization going which only adds to the flavor. In fact I hope it gets browned a bit; sometimes I rotate the ear to brown it on another side. Remove with tongs when your corn reaches the done stage you like. Sometimes I take a quick bite to test for eating readiness! 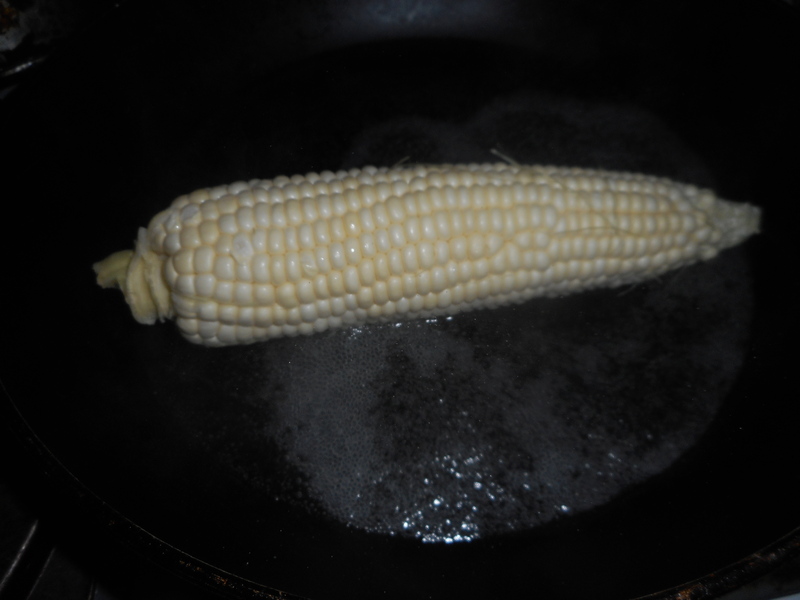 Serve your ear(s) with salt and butter and enjoy fresh corn without heating the kitchen up much. PS: when I camp I like to try new ways and old ways to cook stuff. We had corn that was fire baked in the ashes made by fruit wood; very tasty and we had corn I griddled/steamed on the camp stove. The camp stove corn had a foil tent to somewhat keep in moisture. But I have to say it still dried out more than I like, almost like freeze dried and reconstituted corn. The same thing seems to happen when I cook ears on my charcoal grill. The fire baked corn is created by getting the ears wet; soaked in a bucket of water and then buried in a small layer of hot ashes for about 20 minutes. You risk some char but that’s okay. The rest of the ear is just delightful. Maybe I will try foil this next camping trip; with a bit of water in there to help the ears steam. Will keep you posted on my results. Revised from a post originally published in 2016. 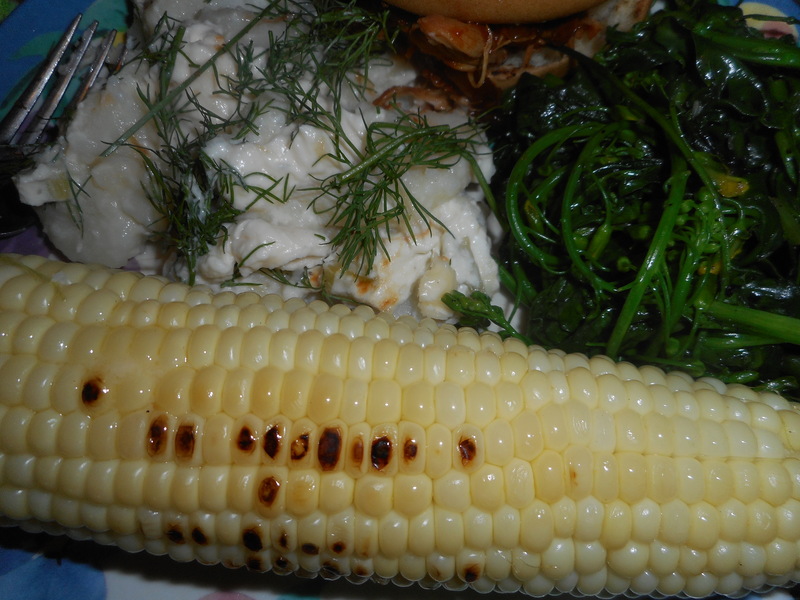 I started making this simple side dish three years ago; we have enjoyed it for a number of holidays. I like it alongside a roasted meat like ham or turkey. I always serve it on Thanksgiving Day: far healthier than that casserole full of sugar and marshmallows. For all the yummy food I serve for big feasts, this humble side dish often gets the most praise. There generally is very little leftover. I love it because it is healthier than most yam/sweet potato casseroles. It is free of gluten, grains, eggs and refined (read white) sugar. If you use something other than butter it can be dairy free too. No tons of butter, marshmallows or cup of brown sugar. Less than a quarter cup of sweeteners make this a good choice for pre-diabetes. I generally use the coconut oil rather than butter; it adds a subtle flavor I enjoy. Plus yams themselves are quite good for you. We love their natural sweetness. And it is so easy to throw together. Just peel and dice up the yams, mix up the other ingredients in a small saucepan and pour over, bake and enjoy. So easy but the flavor is subtle yet very pleasing. I suggest 4 large yams but I often use 5 or 6 smaller ones. Simple, tasty and healthy; side dish home run! Preheat oven to 400 degrees. Wash sweet potatoes, peel if you like (it’s not all that necessary), chop into fairly uniform 1/2 inch cubes, and place them in a 9×13 inch baking dish. Over low heat, melt the butter and coconut oil. Stir in the honey, molasses, and spices. Drizzle over sweet potatoes, then sprinkle with salt. Stir to evenly coat, then bake for about 1/2 hour, or until potatoes are fork-tender. I like to stir it up once or twice while it bakes so that yummy sauce can sink into every bite of yam. I can’t remember where I found this recipe: I think it was in a magazine. The original version left the skin on but I am not that brave with company; but go ahead and try it….let me know if people like it that way. This recipe was originally posted by me in late 2014. Summer time is the best time to cook with garden produce; makes the most sense, that’s when they are at their peak of quality and variety. I love to make this dish every year in the late summer particularly when I have most of the vegetables growing in my garden. Ratatouille is a French dish made of eggplant, zucchini, tomatoes, onions, peppers and lots of olive oil and basil. To me it tastes more Italian with all those veggies and the olive oil and basil. It’s a great side dish with grilled meats or fish and I love it inside an omelet or alongside a slice of quiche. And yes, I know there was a kids movie out in 2007 by the same name. Disney even came out with their own recipe for ratatouille! Lots of veggie chopping for this delicious dish and then you should stir it carefully as the mixture cooks in a big pan. I like to make it in a wok or paella dish. I have a Teflon paella dish that I use these days; holds a lot and things don’t stick to it. Tips: The amounts are somewhat fluid; I don’t really measure the veggies; just use an approximate amount. Be sure to cook the eggplant until it is mostly done before proceeding to the next step or your dish will be less than stellar. You can use red, orange, yellow or green bell peppers and yellow summer squash works just as good as zucchini. I used a huge pale green bell pepper in my photographed version. Just makes sure all your vegetables are fresh and best quality. Put 3 tbsp. of the oil in a large frying pan; 16 inch or wok works well. Add the eggplant slices and toss the slices around to evenly soak up the oil. Fry turning occasionally; try to get them at least half done and then add the zucchini half moons. Keep frying until both are just about done. Turn out into a big bowl. Add the rest of the olive oil and when it is hot; add the onion bits. Cook about 5-6 min until softening. Add garlic and cook a minute. Add the sliced pepper and cook 5-6 minutes until softening. Add the diced tomato. Stir well. Cook about 5-6 minutes and add the tomato paste, stir well, add back the zuke/eggplants and until mixture looks mostly done; maybe 10 min. Add the basil and salt and cook another couple of minutes. Great cold the next day; aging in the fridge melds the flavors together. Sweet corn season is here. In many places really good sweet corn can be had, like farms markets, road side stands and even Wegmans! You can get it at Musikfest at a price; $4 for an ear. It is delicious but really? That’s a lot of moola for an ear that costs 40 cents at my local grocery store. Big mark up going on! So make it at home. I don’t know about you but when I only am making one or two ears it seems silly to fire up a tall pot of water. I do steam the corn which only takes an inch or so of hot water but still…too much to do. Last summer, on a hot day, I realized there was a quick and easy way to make an ear…or two without that big hot pan of water and steam. I just take a large frying pan, put a quarter inch of water in it, sprinkle of salt and let it heat until bubbling. I then lay in my ear or two (I think you could squeeze in three) which I have husked and removed all the silk. Then the pan is topped with a lid or a metal pizza pan if your frying pan is too big for your lids. Cook it the usual time; depends on how fresh the corn is. The fresher your corn ears, the less cooking time you need. The steam in the pan will cook it really fast. Maybe 6 to 8 minutes. Originally published June 2015: I thought some of you needed a gentle reminder to try this; gonna be hot in the next seven days here in PA! Sweet corn season is almost here. In some places really good sweet corn can be had already! I don’t know about you but when I only am making one or two ears it seems silly to fire up a tall pot of water. I do steam the corn which only takes an inch or so of hot water but still…too much to do. Last summer, on a hot day, I realized there was a quick and easy way to make an ear…or two without that big hot pan of water and steam. I just take a large frying pan, put a quarter inch of water in it, sprinkle of salt and let it heat until bubbling. I then lay in my ear or two which I have husked and removed all the silk. Then the pan is topped with a lid or an empty pizza pan if your frying pan is too big for your lids. Cook it the usual time; depends on how fresh the corn is. The fresher your corn ears, the less cooking time you need. The steam in the pan will cook it really fast. Maybe 6 to 8 minutes. Hard to see; black pan. But the corn is in a small pool of bubbling hot water. Don’t you just love finding new ways to make fresh, tasty veggie dishes? I had some fresh spinach but didn’t want a salad. I have enjoyed something like this in a Boston steak house, cost like $9 for a serving! And there were a few spears of uncooked asparagus I wanted to use up. What to do….what to do? Wok it! This is such a simple recipe but a great spring side dish. I had it with some homemade chicken salad. Good side dish if you are avoiding carbs like bread or pasta. I have a few friends who are into low carbing so they should be thrilled. Steam asparagus in minimal amount of water, like 3 minutes in a small sauce pan. Meanwhile, I used my mini wok pan to make the rest of it. Heat pan, add olive oil. 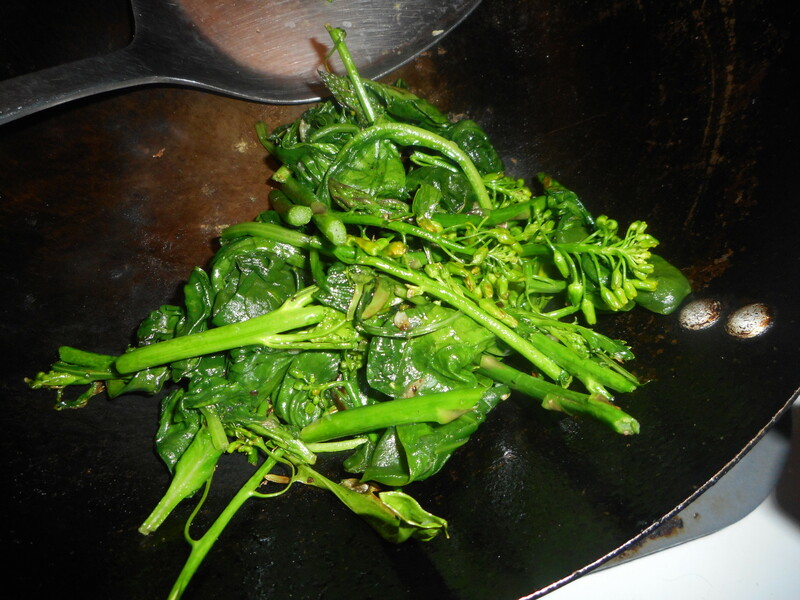 Let heat, throw in spinach, stir once, add minced garlic clove, and stir a few times until it wilts. Add the asparagus which is barely done. Stir for a minute and serve. I made it another day with some kale blossom stems (unopened flowers) and that was yummy too. You could add broccolini stems or broccoli rabe if you have some. If your asparagus is skinny you can add it with the spinach and only use one pan. This quick side dish is full of vitamins and great to enjoy with any sort of protein. I started making this side dish almost a year and a half ago, have made it for a number of holidays. We had it again Easter Saturday along with a big roasted chicken and mashed potatoes, the whole chicken dinner complete with challah bread which was a first for me gluten free and an almond honey cake with candied lemon peel slices on top with some fresh raspberries. But with all the yummy food, this humble side dish was sort of the star. There was very little left and most of us had seconds. So I figured it was time to share it; so you have it next time you make a big meal and want a simple yet yummy and healthy side dish. I love it because it is healthier than most yam/sweet potato casseroles. It is free of gluten, grains, eggs and refined (read white) sugar. If you use something other than butter it can be dairy free too. No tons of butter, marshmallows or cup of brown sugar. Less than a quarter cup of sweeteners make this a good choice for pre-diabetes. I do use the coconut oil; adds a subtle flavor I love. And it is so easy to throw together. Just peel and dice up the yams, mix up the other ingredients in a small saucepan and pour over, bake and enjoy. So easy but the flavor is subtle yet very pleasing. I use 4 large yams but I often use 5 or 6 smaller ones. Simple, tasty and healthy; side dish home run! Preheat oven to 400 degrees. Wash sweet potatoes, peel if you like (it’s not all that necessary), chop into uniform 1/2 inch cubes, and place them in a 9×13 inch baking dish. Over low heat, melt the butter and coconut oil. Stir in the honey, molasses, and spices. Drizzle over sweet potatoes, than sprinkle with salt. Stir to evenly coat, then bake for about 1/2 hour, or until potatoes are fork-tender. I like to stir it up once or twice while it bakes so that yummy sauce can sink into every bite of yam.